Babblings of a Mommy: Squinkies Review. Listen up parents, I have a toy that your daughters will go gaga for! Squinkies are a tiny, soft, squishy toys that come in a bubble and can be collected and used in playsets, bracelets/rings, or even pencils. Squinkies was kind enough to send me the Cupcake Surprize Bake Shop for my daughter and oh. my. word. did she looove it! I'm talking HOURS of fun people. 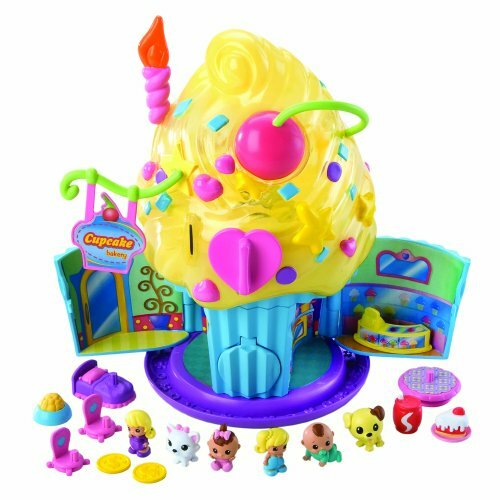 The Cupcake Surprize Bake Shop comes with it's own squinkies but also accessories such a table, chairs, bed, and even food to play with! Since each Squinkie comes in a bubble the top of the cupcake shop is like a gumball machine. All you have to do is remove the cherry to insert all the squinkies for easy storage! Want to take them out? The Cupcake Shop comes with two coins that when inserted drop down a squinkie! Squinkies can be found at Toys R Us, Target, Wal-mart, and Amazon. To find out more information about Squinkies go to www.squinkies.com or follow them on Facebook and Twitter. My 6 and 8 year old nieces just love Squinkies. They're so cute. My nieces love the fact that they can go on a pencil. This reminds me of erasers in my elementary school days that were flower shaped and smelled heavenly. I like the fact that the play structures (cupcake, gumball, etc.) are good carrying and storage cases. I found some great deals at http://www.squinkies.co Saved me lots of trips to the store. were can u buy them in packs like this?